"This is a favorite for the cream cheese lovers!" Grease an 8x8-inch baking dish with butter. Beat cream cheese in a bowl with an electric mixer until light and fluffy. Gradually beat in confectioners' sugar and vanilla extract until smooth. Melt chocolate in a microwave-safe bowl in 30-second intervals, stirring after each melting, for 1 to 3 minutes (depending on your microwave). Beat chocolate into cream cheese mixture until smooth. Stir in pecans. Pour chocolate mixture into prepared baking dish. Chill until set. It is AMAZING. It is more like cheesecake candy. Very sweet, very rich cheesecake candy. Would be really yummy with dried cranberries. I make this with pistachios and 1/4 cup of Irish cream . A very simple no-fail recipe that makes a nice fudge in very little time. This would be a nice addition to your holiday table. I added 1/2 cup cherry chips to it and got a great cherry fudge. This recipe is so easy and so good! I love the flavor the cream cheese gave it...it was like eating cheesecake fudge. Will definitely be making this one again! 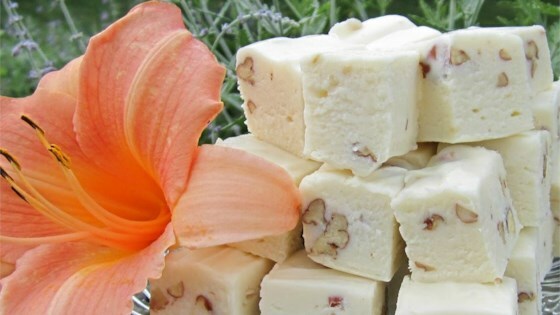 Very sweet and tasty fudge for a special occasion. The hardest part is taking time to Gradually beat the powdered sugar into the cream cheese. Otherwise very easy and yummy!